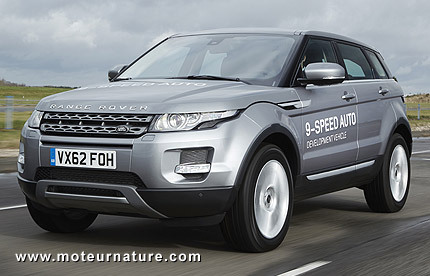 Range Rover Evoque leads the world with new 9-speed auto transmission, or does it? Advertisers have said it for years: more is better. The grass can always get greener, and it should be also be true that more gears make a better transmission. Really? The argument is that adding gears increase their spread. The first gear can be shorter while the top gear can get longer. It should be the best of both worlds with short gears for quick acceleration when the driver asks for it, and very long gears to keep the engine at low revs for economy when cruising. Seven and eight speeds auto transmissions appeared in the last decade, and the latest Porsche 911 has a seven speeds manual gearbox. But ZF, the transmission specialist, is going one step further with an incredible nine speeds auto transmission. And it’s real, this car is not a prototype. The 9-speed transmission will be mass-produced and the Range Rover Evoque is only the first model to get it (Chrysler should soon follow). Both manufacturers, Jaguar Land Rover which builds the car, and ZF which makes the transmission, say the car will be faster and more fuel efficient with that new automatic compared to the previous one which had only six gears. We shall believe them, but we may wonder if the car will be as nice to drive. What we may worry about is that to make things work as planned, the car will have to change gears very, very often. Let’s hope engineers will have found a way to make super fast gear changes. Or maybe first gear will only be used for starting uphill, and that the car will only upshift to ninth gear when on a highway going downhill. So that the two extreme gears will be used in special driving conditions, and that there will be only six gears used in daily driving. A test drive will tell the truth, and it’s likely there will be a strong difference between the fuel economy measured in ideal official tests, and real world driving conditions.